THE Food and Agriculture Organization (fao) has warned that the booming potato production in developing countries may receive a setback due to global economic slowdown. In its year-end review titled 'New Light on a Hidden Treasure,' released in December 2008 to commemorate the end of the International Year of Potato,fao said economic slowdown may reduce flow of investment and assistance to developing countries. This includes reduced Support to agriculture that will directly affect potato cultivation. The report also said that developed countries already impose stiff tariffs on imported potato products, may be tempted to raise trade barriers. The banking crisis on the other hand, will leave many farmers with no credit to invest in production in 2009. 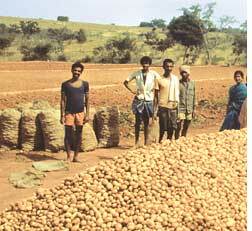 Potato is an important staple food and cash crop in developed countries. It has been recommended as a food security crop to help low-income farmers tide over food crises. As per fao statistics, potato is the world's number one non-cereal food crop. A vigorous new agenda for potato research and development aimed at protecting the food security of developing countries is needed, said NeBambi Lutaladio, coordinator of fao's International Year of Potato 2008 secretariat. To promote potato production, fao recommends the 'Cusco Challenge' promoted by the International Potato Centre in Peru. The challenge urges framing a new research agenda for increasing potato yields, improving quality and making them pest and disease resistant. Lutaladio said farmer access to credit and production inputs, and links to agro-processing and markets is equally important. Potato is seen as a means to achieve the first Millennium Development Goal--end poverty and hunger.